The WooCommerce and Zoho CRM Connector Pro plugin helps WooCommerce managers and webmasters transfer data between their WooCommerce stores and Zoho CRM – a customer relationship management platform that helps brands and businesses keep track of customer contacts and their interactions with the business. 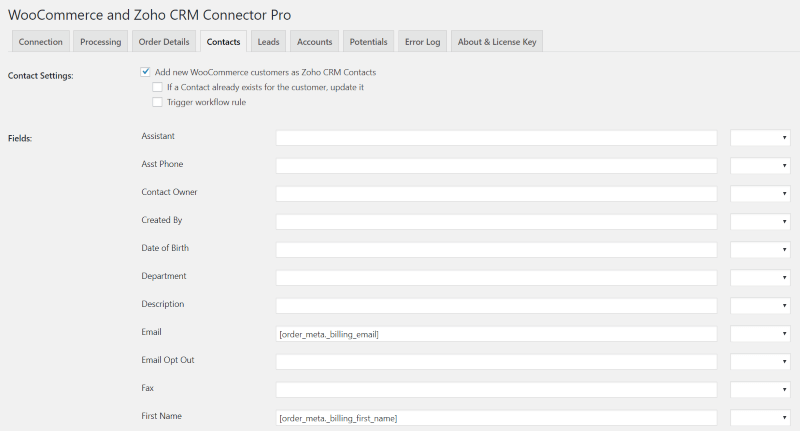 The WooCommerce and Zoho CRM Connector Pro plugin transfers data from the WooCommerce store on the WordPress website to the Zoho CRM platform. Users can manually or automatically create Contacts, Leads, Accounts and Potentials within the CRM based on data in the order and elsewhere in the WooCommerce database. Please note: The WooCommerce and Zoho CRM Connector Pro plugin has been created to work with the free version of Zoho CRM and is not designed to work with some of the features in the premium version of the customer relationship management application. 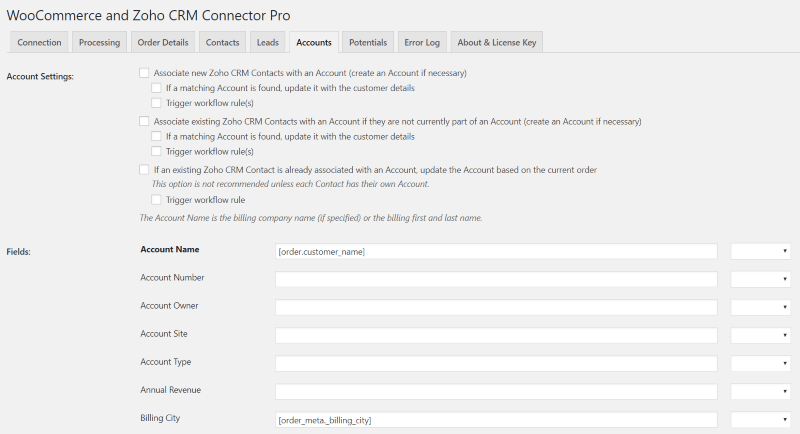 The WooCommerce and Zoho CRM Connector Pro plugin is not designed to create Products or Sales Orders in Zoho CRM, but is intended to work with Contacts, Potentials, etc. Edit the mapping of WooCommerce data into Zoho CRM Contact, Lead, Account, and Potential fields. Add a note to the contact and/or lead corresponding to the customer. Associate contacts with an account, creating or updating the account if necessary. Send order data to Zoho CRM on order status change (Pending Payment, Processing, Completed, or a custom status) rather than on order creation, or only send order data manually. Designed to help brands and businesses manage their WooCommerce online stores better with the help of an external Customer Relationship Management tool, the WooCommerce and Zoho CRM Connector Pro plugin integrates a WooCommerce online store with the web-based Zoho CRM platform. 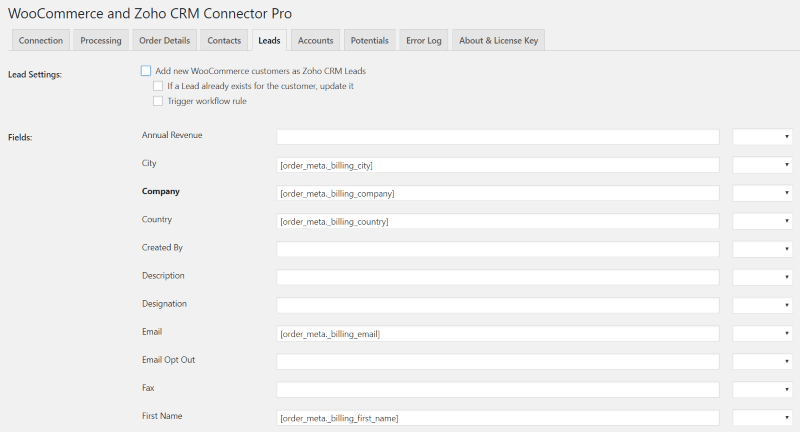 The WooCommerce and Zoho CRM Connector Pro plugin has a clean interface that maintains the WordPress aesthetic. After installing and activating the plugin it will create its own menu item in the WordPress dashboard, beneath the WooCommerce menu item. 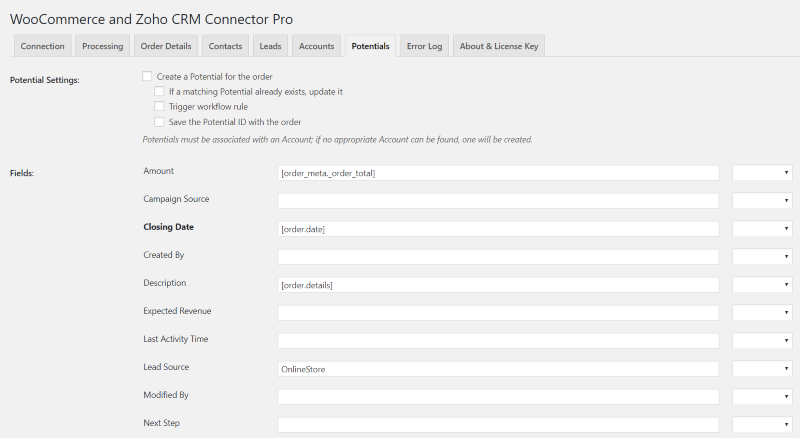 The WooCommerce and Zoho CRM Connector Pro plugin’s admin interface is comprised of a series of tabs, each of which displays a number of various settings. These settings allow the user to set the specifics of the integration with Zoho CRM, including definition of the mapping of WooCommerce data onto fields in supported Zoho CRM objects. The Connection tab simply lets the user connect their Zoho CRM account to the WordPress website. Here, the user enters the Zoho CRM URL and account details to initiate the integration. The Processing tab offers settings that will allow the user to determine when data should automatically be transferred between the WooCommerce store and the Zoho CRM platform. Here, the user can decide whether automatic data transfer should take place when an order is created, transitions to a certain status (e.g. paid, completed etc. ), or not at all (allowing for manual-only transfer). Also, the user can decide whether they’d like to activate Isolation Mode to help reduce the potential impact of any errors that occur when data is transferred automatically. Within the Contacts tab, the user can configure the integration with Contacts in Zoho CRM, such as field mappings and automatic Contact notes with order details. Within the Leads tab, the user can configure the integration with Leads in Zoho CRM, such as field mappings and automatic Lead notes with order details. The Accounts tab lets the user set a number of options for creating and updating Zoho CRM Account records, including field mappings. In the Potentials tab, the user can set options and field mappings for Potentials, which can be created to correspond to individual orders. This tab also provides the option to automatically update the Stage of the Potential associated with an order when that order’s status changes, according to the Order Status / Potential Stage mappings defined within the tab. The plugin keeps track of detected automatic order processing failures in the Error Log tab, listing the Order ID and a timestamp for each entry. Please note: The screenshots are from version 2.0.7 of WooCommerce and Zoho CRM Connector Pro. For the latest feature list update of version 1.0.1 please refer to this blog post.